Post your ID below, Id's will be sent in every evening. Once your id is sent in, the casino will load it into the system. You will then be able to play the tournament. accounts will not be loaded on the weekends. banner to open your account, you are automatically entered, just login and play! your ids to be sent in. lobby, you will be able to see the tournament. our Exclusive $15 Free New Player Bonus! 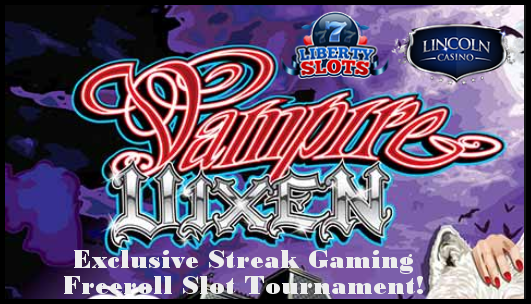 $15 Free No Deposit For New Players At Liberty Slots Casino(WGS) Exclusive Offer!! that download from a Streak Gaming banner $15 Free! Click the link below to find out how to claim your bonus today! $15 Free No Deposit For New Players At Lincoln Casino(WGS) Exclusive Offer!! Hi clark68071908.. your id will be sent in with the next batch. Thanks for entering everyone, I will send ids in first thing in the morning! Could you add me please? ty!! Hi whyyes, your id will be sent in with the next batch. Hi, can you please enter me into the tournament at both casinos? LC0418750124 & LS0113229658, thank you very much. Hello! Please add me to the tourney.